For now, at least, I would ONLY consider donning mesh riding jackets. Leathers are too warm for perpetual-summer Singapore (and our near surroundings), and I have no intentions of tracking, racing, or intentionally doing anything stupid on my bike – again, for now, at least. 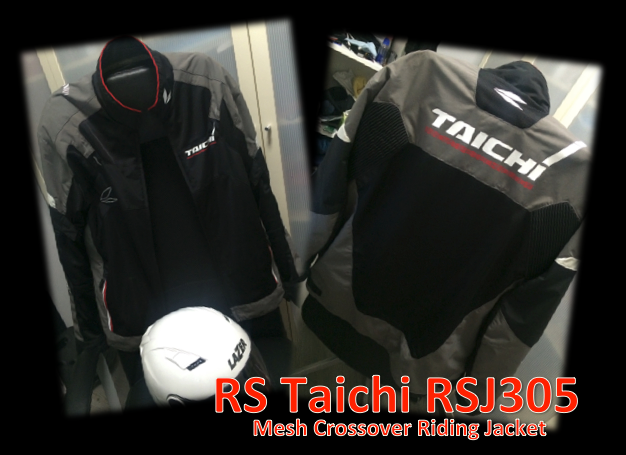 I’ve got the RS Taichi RJ305 Mesh Crossover riding jacket for some time now. You can read more on my purchase here [click here]. I’ve worn it for more times than not when riding. Yes, I’ll admit that I’m not a ATGATT kinda guy. I’m more of a MTGMTT person – *MOST* of the gear, *MOST* of the time. Anyway, back to the jacket. In short – I LOVE IT! Now, apart from protection, the thing that’s on the very top of the feature list that I look out for in a riding jacket is COMFORT. 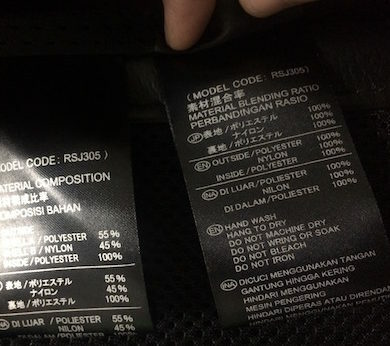 And, yes, the RS Taichi RJ305 Mesh Crossover has just that. If you’ve read me previous post on my purchase of this jacket, you’ll know that I picked this up because I loved it for it’s comfort when I was trying on riding jackets in the store. But that was in the store – air-conditioned and in a very comfortable environment. Will this mesh crossover hold up in the brutalities of the hot-hot-hot Singapore weather? I’ve found that it remained very comfortable, even when I was riding under the punishing afternoon sun – hot and humid with temperatures commonly hitting 32degC. In fact, when under the scorching sun, it was probably more bearable with the jacket on that without. It helped to shield the penetrating sun rays from quite literally frying me. Casual clothes such as cotton, don’t work as well when it comes to shielding skin from the merciless afternoon sun. This jacket was just about thick enough to help insulate those rays. The inner liner of this mesh jacket is made with some CoolMax-like material. Moisture wicking, cool in summer but warm in winter kinda stuff. I don’t know about the keeping warm in winter part, but the former certainly seem to be really working. Even if I were just wearing a short-sleeved cotton T-shirt on the inside, the liner doesn’t feel scratchy at all. It has a silk-like feel to it and doesn’t stick to the skin. Thus allowing perspiration to dry, cooling the body down. The last thing you want in a hot and humid environment is to have some clothing sticking to your skin, forming a insulative barrier that prevent effective cooling. Oh, and do you see those holes there? Mesh! Yup! It’s breathable mesh. Also aids in air flow – which I get tons of it with this jacket. As long as I’m moving – even in slowish city traffic, it doesn’t feel warm at all. Air flow is really good around areas of the body where heat tends to build up – the upper arm and chest areas. 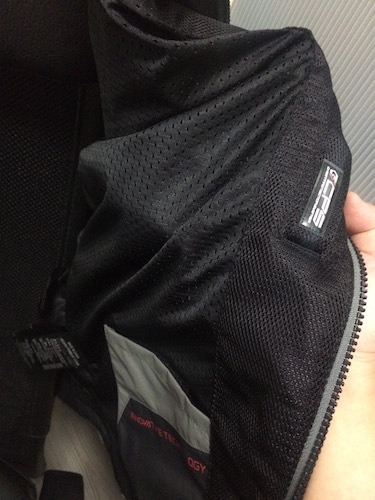 The back of the jacket also has a very large piece of mesh which helps the incoming air escape – creating very effective air FLOW. 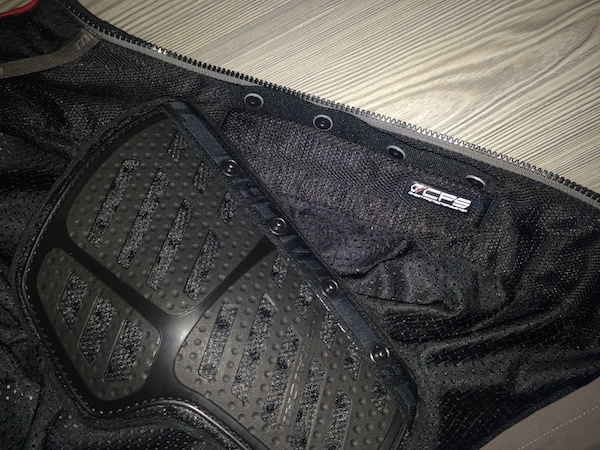 So this high-flow mesh and CoolMax-like lining also helps when the bike’s not moving – such as stops at traffic lights. 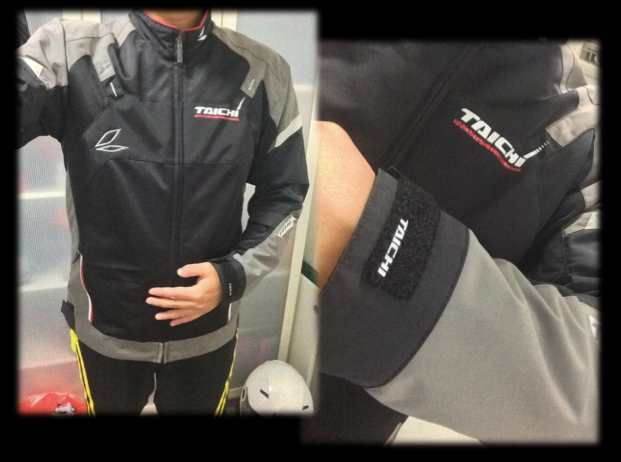 What seem to happen is that as I ride, it cools the inside of the jacket by evaporating moisture (perspiration). And then at stops, when there is no air flow, the CoolMax-like lining starts wicking perspiration, thus keeping me cool. Now, that’s a COOL combination! In fact, I like the lining material so much that I’ve found the BEST time to put on the jacket is if it’s been hanging in an air-conditioned room for some time. It actually feels cool immediately when worn! And it remains cool long enough for me to put on my helmet, gloves, mount the bike, start the engine, and move off… and then I get the wind-cooling effect to cool me as I move off. Of course, this riding jacket also comes with CE-approved elbow and shoulder pads. They are easy to remove and is adjustable for height too. I didn’t take pictures of that, but you can quite easily find how it works with a Google search. A foam back protector comes standard with the RS Taichi RJ305, which you can upgrade by replacing it with a CE one if you so wish to. I think the basic back protection is good enough for me for now. One disappointment is that it doesn’t come with front chest protectors. But it is RS-Taichi Chest Protection System (CPS)-ready and you can purchase the optional and removable chest protection piece. It snaps on very easily with 4 snap buttons. As I intend to tour with this, I paid $45 for the chest protector too. Like an unstrapped helmet that’s not going to be sufficiently protective, the jacket’s not going to be of much use in a crash if it’s not zipped up all the way. So I tend to go as high as I comfortably can. In my previous jacket, the collar felt scratchy and uncomfortable. It was also made of some synthetic leather which I suspect may start to peel after awhile. The RS Taichi RJ305 is nothing like that. It is very very comfortable, and it’s fabric – which I suspect will last a very long time. One minor thing that I wished this jacket to come with is a removable waterproof inner liner. My previous jacket came with it. This is useful for riding in colder weather (evenings and early mornings), and especially useful as a makeshift (light) rain jacket if I’m lazy to pull out my rain jacket. But that said, not including one or even having it as an optional accessory is not a deal breaker here. So, overall, I found this to be a very high quality piece of protective gear. As you can tell, I’m very happy with this purchase. I haven’t tried washing it yet, but the instructions says “hand wash”. Thankfully, I have a front-load Samsung washing machine with a “hand wash” feature. This washing machine also has an “air wash” feature which “refreshes” clothing such as jackets and dry-wash-only stuff by blasting warm air while churning in the front-load drum. So I might use that periodically to “refresh” the jacket when it starts turning eeky, but not eeky enough to put it through a water wash.